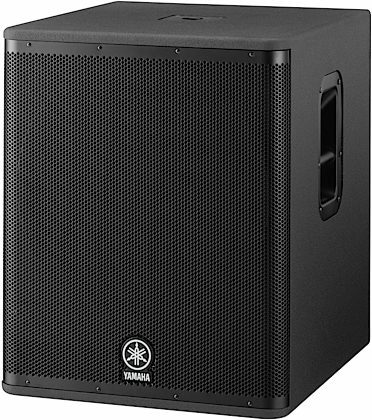 Rounding out the low end of Yamaha's high-end DSR Series of active loudspeakers, the Yamaha DSR118W powered subwoofer packs a powerful punch in its 800-Watt, 1x18-inch footprint. A ferrite compression driver and an 800-Watt Class-D amplifier with a switch mode power supply work hand in hand with advanced DSP to protect and serve all functions of this powerfully hefty yet compact subwoofer. Anticipating a raucous show? Bring it on -- the Yamaha DSR118W can handle it. 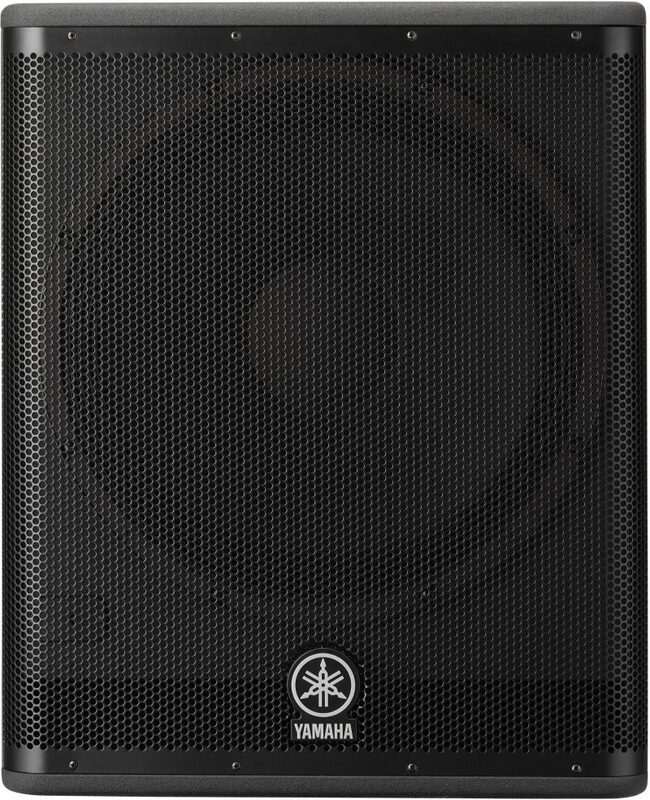 This active subwoofer's Class-D amplifier outputs 800 Watts of pure power through a premium 18-inch speaker, maintaining precise dynamics and faithful sound reproduction. Together, the amp and a PFC switching mode power supply deliver impressively high 132 dB peak SPL, and clean, efficient operation throughout demanding performances. With Yamaha's protection functions there to safeguard the power supply, power amplifier modules, and transducers, you can play your music as loud as you want without hurting anyone or anything involved. Overloads, clipping, and overheating issues are toast. Premium AD/DA converters and 48-bit internal processing make for high-end sound as well, offering superior S/N ratio and dynamic range. Ready for the road, the DSR118W sports a heavy-duty 16-gauge steel grille for protection against stage rage, along with large metal handles for easy transport and setup. 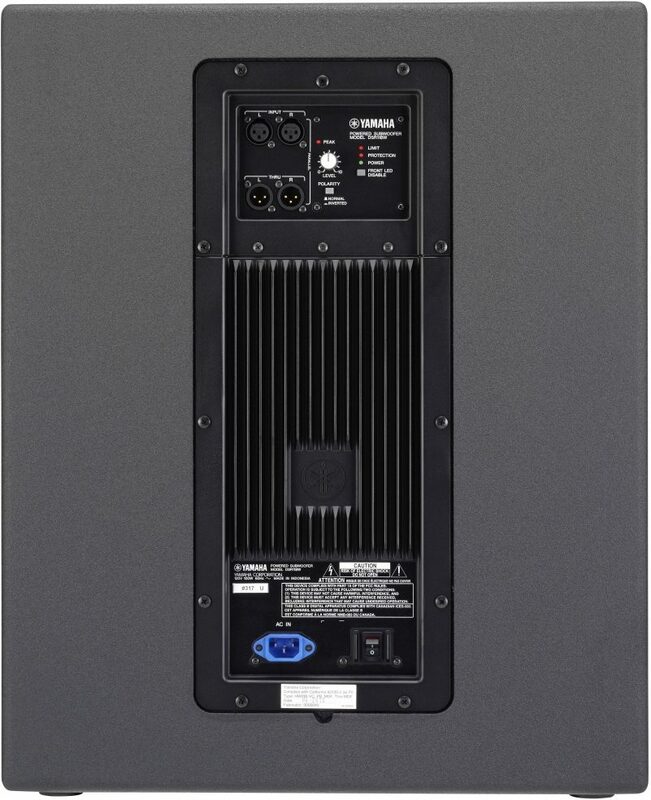 A top-panel pole-mounting cup accommodates sub-satellite configurations -- mount your DSR-series top boxes above the DSR118W for a full-range powered PA system. The DSR118W powered subwoofer is part of Yamaha's revolutionary DSR Series of active loudspeakers. The DSR Series takes full advantage of Yamaha's expertise and experience amassed as one of the world's leading pro audio manufacturers. - Compact and lightweight, yet capable of 800 watts power output. Loudest,cleanest output of any loudspeakers in their class. - Extensive protection of the transducers, amplifiers and power supply from high performance DSP. - Exclusive LTBD (Long Throw, Broad Dispersion) constant directivity waveguide horns provide expansive coverage. Yamaha's next-generation Class-D amplifiers deliver 800 watts of power with precision damping for tight and crisp sound from compact, lightweight modules. Through the ideal combination of amplifiers, transducers and DSP, the DSR Series loudspeakers provide the highest levels of power in their class, while maintaining precise dynamics and sound reproduction. Efficiency is such that convection cooling is all that is necessary, eliminating the need for fans. DSR Series speakers employ a Yamaha-developed high efficiency switching mode power supply with PFC: Power Factor Correction The full resonance switching method uses both voltage resonance and current resonance, creating a clean power supply waveform with minimal high frequency noise. PFC harmonizes the phases of the load current and power supply voltage, maximizing power output and ensuring stable operation under severe conditions. This clean, efficient power supply enables the entire speaker system to achieve its full performance potential. To ensure the highest possible reliability, the DSR Series employ many of the same protection functions used in Yamaha's top-class TXn Series professional power amplifiers. These functions protect all aspects of the power supply, power amplifier modules and transducers so that they can operate to their full potential while ensuring fail-safe operation even under the most severe conditions. The DSR Series' HF and LF transducers are custom designed for maximum efficiency and sound quality, and to optimize system performance. Heavy-duty 16-gauge steel grilles protect internal components from the rigors of road abuse. As a product of Yamaha's long experience and expertise in loudspeaker design, the cabinets exterior finish features a Line-X(r) coating, which boasts military-grade durability. Large lightweight metal handles are designed for easy handling without affecting sound quality. The same standards of quality that apply to Yamaha's high-end digital mixing consoles are maintained. Every process from initial design to final manufacture is performed in-house under stringent Yamaha quality control. For loudspeakers you can count on to deliver the musicality and sound that will thrill audiences night after night, let the Yamaha DSR Series power your performances to incredible heights. Overall: I switched back and forth between this sub and the QSC, but finally decided to take the plunge and get this. I am so happy I did. I use this with my Bose L1 Model 2 and this thing kicks and then kicks some more. The deep bass is unmatched. If you are playing in a medium sized or large hall this sub will shake the roof off. Love it!! And I can carry it by myself. Awesome!!! Style of Music: Reggae, R&B, Hip Hop, Soul, some Country and Rock.